Sugar Land, Texas | November 30, 2010 | Gloria Giersch Vaughn, Certified Teacher of the Visually Impaired with Vaughn Consultants, has been recognized by Elite American Educators for her dedication, commitment, and leadership in education of the visually impaired. At Vaughn Consultants, Mrs. Vaughn manages 15 visually impaired babies and 11 children with multiple disabilities. Mrs. Vaughn enjoys seeing children grow and become productive citizens in whatever way they can with her help and dedication to their education. Mrs. Vaughn has also published children’s stories and received various awards for excellence in service. She advises others in her field to maintain an open mind when dealing with children, do not leave any doors unopened, and think of all the possibilities. She also knows that communication is everything; do not be afraid to communicate with a student. In her nearly five decade career, Mrs. Vaughn’s greatest accomplishment to date has been walking into an ordinary classroom and noticing that a twelve year old had minimal visual abilities. Mrs. Vaughn dedicated her time to teach this child how to adapt, and now the child can now sign, write, and read in brail a vocabulary of 100 words. Mrs. Vaughn then applied for a grant for this child and the child has since become successful; she now smiles often, enjoys signing, and continues to grow. Mrs. Vaughn was able to take a child that had no communication abilities and a mentally retarded label by the school, and turn her into a studious student and an accomplished young woman. 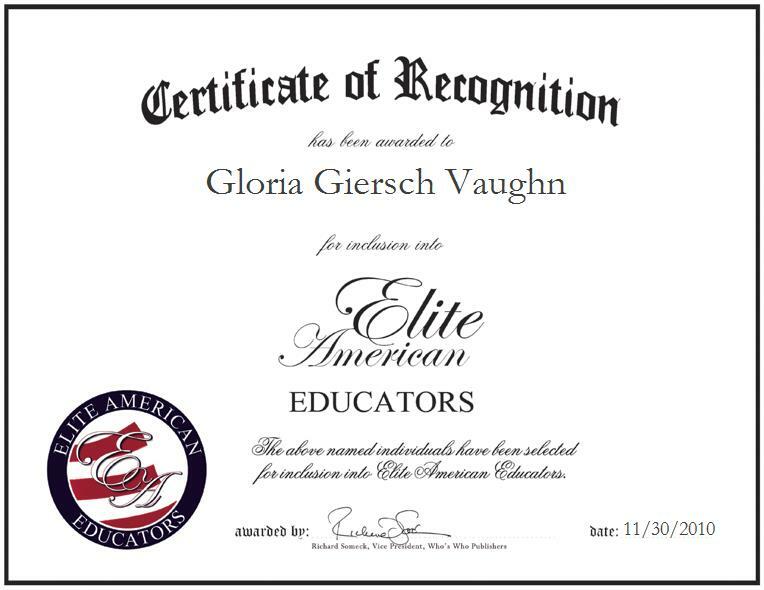 Gloria Giersch Vaughn was originally selected for inclusion in Elite American Educators in November, 2010. We are proud to be featuring Mrs. Vaughn again in Elite American Educators for 2013/2014.